Childhood is a funny thing. And, ironically, the further away from it you get, the longer looms its shadow. Australian writer Sonya Hartnett gets this, and she gets this in spades. She is nominally considered a “young adult” author, although she also writes for adults (Of a Boy is one of her “adult” books, despite it concerning, and taking place in, a nine-year-old’s world). This is not my first foray into Hartnett’s writing. Ten-odd years ago she wrote, under the pen name “Cameron S. Redfern”, the roman a clef Landscape With Animals, supposedly a barely fictionalised account of her affair with a well-known member of the local literary establishment. It is very, very good, although I can’t see a picture of the aforementioned member (ooh er, matron) these days without immediately (re)calling to mind one or two scenes from that book, details of which I won’t go into here. She is probably the most decorated of our modern writers, too – she tends to pick up awards the way some of us pick up takeaway food. Of A Boy, published in 2002, also won its fair share of accolades. 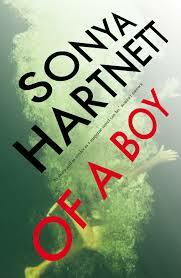 And fittingly so – there are plenty of reasons here to delve into more of Hartnett’s output of 20-odd novels. Of A Boy is a slight novel, a mere 186 pages, easily read in one sitting (or in my case, two). It opens with a retelling of the final moments of the three Metford children, aged 10, seven and five, who set out on a foot for the local, suburban milkbar to buy ice cream, but never return home. I am guessing it is loosely based on the (in)famous case of the Beaumont children, who disappeared at a similar age from a South Australian beach in 1966; no trace of those children has ever been found. The Metford children’s disappearance is just another issue to add to the ever-growing pile of worries that afflict nine-year-old Adrian. He is an anxious little boy who lives with Beattie, his hard-nosed, 60-year-old grandmother (or grandmonster, as he sometimes thinks of her), and his uncle Rory, an agrophobic twentysomething who struggles with the mental demons left behind by a car accident that killed his best mate. Adrian has been abandoned by a father who doesn’t want him and a mother (Beattie’s eldest daughter) who cannot care for him, for reasons unspecified. Another daughter, Maggie (who has renamed herself Marta), visits often, bickers with her brother Rory, and needles her mother, particularly about the presence of Adrian – a quiet, unassuming boy – in the family home. Adrian’s problems aren’t limited to home, either – at school he has one friend, Clinton Tull, the last line of defence before he falls into the abyss of friendlessness and ostracisation, an edge on which he is always teetering. Hartnett captures the sense of these devastatingly cruel schoolyard machinations better than any other writer I have encountered; they are so realistic and true to memory that at times they sucked the air out of me as I read on. Forced to play outside one cold day (it is fast approaching winter), Adrian encounters Nicole, a slightly older girl who has moved in next door, along with her younger sister and brother (there’s that combination of three children, two girls and a boy, that is a recurring motif throughout these pages), and her parents. She calls on Adrian to help her nurse an injured bird that later dies; the two children perform a touching burial service. Nicole is abrasive, abrupt and moody; later in the book it will transpire why she dons this protective armour. But for Adrian, she provides a welcome distraction from both home and school, as the sense of abandonment that continually dogs and threatens to overwhelm him – as he is rejected by his schoolfriend Clinton, then overhears his aunt Marta encouraging Beattie to rid herself of him – closes in. It is Nicole to whom he turns, but can this troubled pair of misfits provide salvation for each other? The sense of menace and foreboding that hangs over this novel from the get-go suggests not, although the final denouement is even more shocking than the reader could have possibly suspected. It takes a writer with an incredible amount of chutzpah to condemn her (or his) characters to their ultimate fates. One of the blurbs on the back cover of my copy is from a review in the Sydney Morning Herald, and it sums up About A Boy better than I can: “Exquisitely painful to read … (It) is an almost suffocatingly powerful evocation of the emotional life of the very young … (for) anyone who recalls being a child. And everyone who doesn’t”. And that is exactly the reason why I won’t be rushing out to read another Hartnett book for a while – not because she is not an exceptionally good writer (she is, and then some), but because, almost two months after reading this book, it still lingers in the dark corners of my mind, places I don’t often like to visit. This is not an easy book to shake. Read it, by all means – but don’t expect not to walk away deeply, almost unbearably affected.